You are here: Home » Garmin’s Head-Up Display – how cool is this! Garmin’s Head-Up Display – how cool is this! 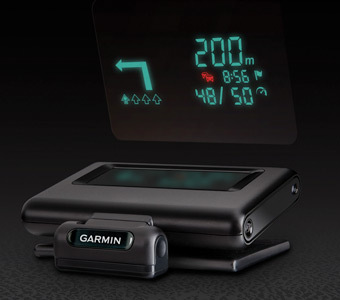 Garmin recently launched their Heads-Up Display (HUD) to be available in August (at least in the US ). The inner geek cannot wait to get this. It seems very reasonable at €129.oo for what it offers. It is hugely practical and so much better than trying to look at the phone or other device for directions. I have seen some head-up displays in high-end cars (unfortunately not mine) but this stand alone device makes so much sense! Its independent of the car, can be updated easily (or at least the app on the iPhone can) with latest maps updates, improvements etc. ← LinkedIn – Where do I start?